Students apply the principles of force while creating an actual bridge without the use of glue or mortar. It can also be used as a geometric puzzle by having your students build it without the template. 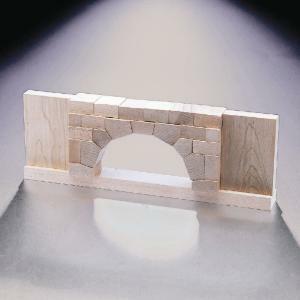 It includes 23 precision cut hardwood blocks in six unique shapes, predrilled buttress in three sections, all hardware, instructions with historical background, and a full-scale template. Once the keystone is assembled, the arch is actually strong enough for students to stand on. Block size is 1 1/4".